The artist, circa 1920, from "Chagall and the Artists of the Russian Jewish Theater"
VITEBSK, Belarus — There’s no business like Chagall business. At least, not in the hometown of the legendary artist. 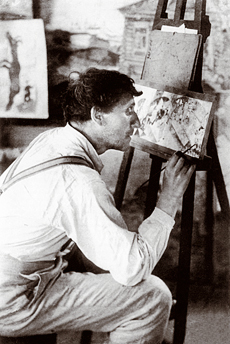 Shunned by the Soviet authorities for his leaving the “worker’s paradise” of the Soviet Union for the artistic incubator of Paris, Marc Chagall has undergone a remarkable posthumous rehabilitation in his Belarussian birthplace. The charming provincial city of Vitebsk, an inspiration for much of the artist’s oeuvre — like his floating, dreamlike images of wood rooftops, barnyard animals and bearded fiddlers — is not only a must-see for Jewish tourists, it’s said to be a cornerstone of national tourism. Located 120 miles northeast of Minsk, the capital, Vitebsk draws German and Japanese tourists and countless foreign art students. Hordes of schoolchildren tour the museum within the refurbished Chagall family homestead. The museum was opened in 1992 and has since been accompanied by annual “Chagall Days,” featuring music, exhibitions, lectures and poetry readings. It’s quite a turnaround for an artist revered by some, scorned by others as a symbol of dissent, and long banned from public discourse. Chagall is now a symbol of another kind, says Vitebsk native Arkady Shulman, a Jewish journalist and amateur Chagall historian.